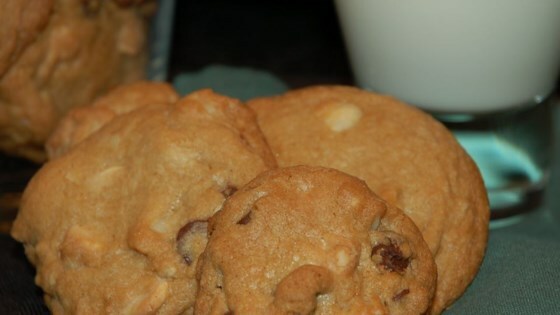 "We love chocolate chip cookies at our house, and these are especially good!! I use a 1 inch scoop to form the cookies." Preheat the oven to 375 degrees F (190 degrees C). Sift together the flour, baking soda and salt; set aside. In a medium bowl, cream together the butter, brown sugar and white sugar until smooth. Beat in the eggs one at a time then stir in the vanilla. Gradually blend in the sifted ingredients. Mix in the white chocolate and semisweet chocolate chips and macadamia nuts. Drop by rounded tablespoonfuls onto ungreased cookie sheets. Bake for 8 to 10 minutes in the preheated oven, or until golden brown. Allow cookies to cool on baking sheet for 5 minutes before removing to a wire rack to cool completely. This is a great recipe... A nice twist. Excellent!! I made a mistake and only used a 1/2 cup of butter but they still turned out absolutely delicious! This cookies were easy to make and tasted great. I took these to a family get together and they disappeared in minutes. My family has already asked to make more for the next get together.